This cool Italy Soccer Flag Distressed Design Player with Ball for players and fans all around the world who want to support italian soccer national team in the upcoming championship this june 2018. Stylish fanshirt to support the italia team. La squadra azzurra - graphic spanish international flag patriotic worldwide football passion tournament cup jersey t-shirt the perfect soccer fan gift idea for this summer, birthday, mothers day or fathers day for soccer mom or dad, men, women and kids. This cool Italy Soccer Flag Distressed Design Player with Ball for players and fans all around the world who want to support italian soccer national team in the upcoming championship this june 2018. Stylish fanshirt to support the italia team. 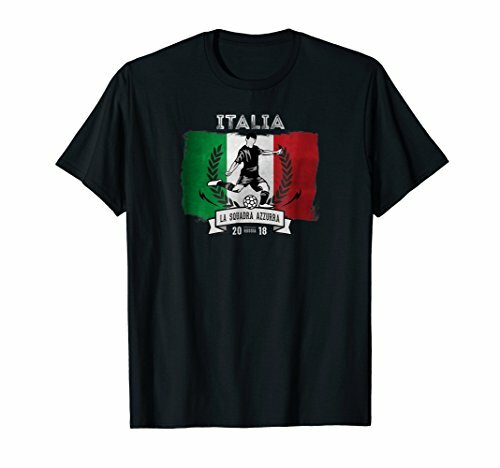 La squadra azzurra - graphic spanish international flag patriotic worldwide football passion tournament cup jersey t-shirt the perfect soccer fan gift idea for this summer, birthday, mothers day or fathers day for soccer mom or dad, men, women and kids. If you have any questions about this product by Italy Soccer Tees Russia 2018 Fan Shirts, contact us by completing and submitting the form below. If you are looking for a specif part number, please include it with your message.